Circuit training on your schedule. NOW OPEN! Everyone makes fitness goals. For some, those goals are about losing ten pounds. For others, the end goal is to finish a marathon. With everyone working towards different achievements, where do you sit? And how can you keep yourself pushing to your goals and going to the gym when you plan on it? We at Circuit 31 Fitness have some tips and tricks to help you. Your fitness goals should be specific and able to be measured. This is a great way to remember what they are in the first place, but writing them down is also a good way to help you figure out what steps you need to achieve the goals. Just saying “I want to lose weight” isn’t going to cut it, though. 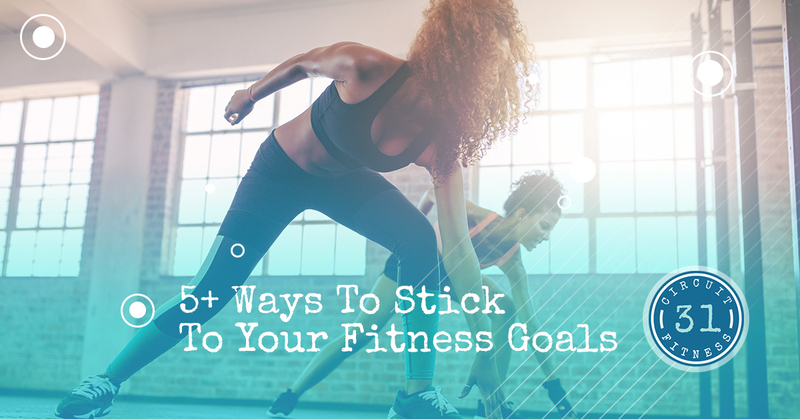 Writing down specific ways to meet that goal, including “I want to work out four times a week,” will help. By breaking everything down and keeping a regular checklist, you’ll be able to more easily attain your goal with focus. Your goals shouldn’t be some far-off fantasy. If you have never lifted weights before, your goal should not be to go lifting seven days a week. Altering your fitness regimen requires a change in old lifestyle habits, and these habits can’t usually be broken overnight. Instead, we recommend including small changes over time. If you want to start running and eventually run a marathon, that’s totally fine! But maybe start with a 5k instead of immediately signing up for the marathon. You’ll get there when you’re ready. While you may want to be able to do 50 pushups in a row without stopping, it’s best to start small and grow from there. Plan to do a few per day, and maybe increase that number slowly, week by week. After a while, it’ll be easy to meet those 50 pushups. Also, think about supplemental things you can do to make your goal easier. If that means going to a fitness center three times a week in addition to your pushup routine, then do it! Once you hit your goals, even if it’s the smaller ones, reward yourself! However, make sure not to choose something that will undo the reward. We don’t recommend a cocktail or an entire cake. Instead, choose a weekend away, a massage, some new fitness attire, or even a movie date. Small but regular treats you receive after hitting a goal can help you strive for those milestones even quicker than you may have thought possible before. Why is it that you have this goal? While a solid and steady gym habit can lead you to incredible body transformations, you might not care about your appearance much after weeks of non stop exercising and dieting. Instead, think about your new gym habit as a way to improve your overall health and quality of life. It can boost your energy and your overall happiness levels! When we bring deeper intentions to our workouts, we can feel more fulfilled and less burnt out over time. This can be the difference when committing to your goals. Before you head to the fitness center, ask yourself why you made this goal and what you want to achieve. Those ideas can help you power through your workout and refocus on your goals. If you don’t know how to use a certain machine or do a certain workout, then ask! The trainers at Circuit 31 Fitness can help you learn the proper technique for each exercise and help you feel more confident in your movements. Also, this is a good idea in general to prevent injury! Our team is there to help you feel more comfortable as you exercise. In our next blog, we will cover even more ways to ensure that you stick with your fitness goals. Check back soon, and contact our fitness center soon for a new workout you are sure to love! We take circuit training to the next level and get you in and out of our facility within half an hour. Contact us today to sign up!